WINTHROP - On Sept. 4, 1776, two months after our nation's Declaration of Independence was signed, 27 devout souls formed the Winthrop Congregational Church. It was the first Congregational church to be established in Kennebec County, and through the years the church stood by its community during wars, drought, depression, cataclysmic storms and a revolution in lifestyle. The church on Main Street has seen the coming of the automobile and the airplane and the passing of the trolley car and passenger rail train. Now on Sept. 9, the church is inviting the larger community to celebrate its rich long history. One of the senior members of the congregation, Russell Hewett, observed, "At the beginning of this town, there wasn't much more than a muddy track up over the hill." For the first 49 years of its existence, Winthrop Congregational Church met in a local tavern, Squire Bishop's Inn. Then in 1825, the church built a grand new structure on upper Main Street. In 1860, a simple vestry for programs, classes and some services was built on the present-day location of the church at the corner of Main and Bowdoin streets. In 1904, the first of a series of renovations allowed the congregation to move down to Bowdoin Street and sell the church on upper Main Street, which now is being used for apartments. The sanctuary was completely remodeled and redecorated in 1945 by Harry Cochrane, a noted church architect from Monmouth. In 1975, a major change in the church included moving the building three feet nearer Main Street, changing the entrance from Bowdoin Street to Main Street, and adding new and enlarged vestry, kitchen and storage areas as well as offices, rest rooms, nursery, chapel, classrooms, lobby and landscaping. In 1998, after more remodeling and the installation of an elevator, the church was declared fully accessible to people with disabilities. The church has 125 members today. The Rev. Jack Steeves is pastor. "They have been a force in the town for these 225 years," said Steeves. "They're active in local and world mission. There's certainly a concern for the children of the community. There's a lot of people here who try to reach out to neighbors and even strangers. The church sees itself as a Christ-centered community that cares about each other." One of the church's most prominent ministers was the Rev. David Thurston, who was pastor in Winthrop for 44 years. Thurston was reform-minded and idealistic. He started the first Sunday school in New England. A program written for the 150th anniversary of the church, in 1926, says of Thurston, "Much of the history of the church centers around his personality. He was a pioneer in all matters of reform and a leader outside of his community on the great questions of the day." Thurston was so strongly anti-slavery that his parishioners forced him to resign. Church members today say they carry on Thurston's message of social activism by running programs on family violence and an after-school program for middle school students. The congregation has four members who have more than 50 years of membership in the church. They are Ruth Perry, 80 years; Beatrice Mayo, 56 years; Margaret Southard, 54 years; and Ethyl Maxim, 52 years. Church members are involved in a wide variety of activities to commemorate the anniversary. "We've asked everybody to take part in some way," said Marie Pettengill, co-chairwoman of the missions committee. A special guest at the Sept. 9 program will be the Rev. John Alexander of Arizona. Alexander was pastor of the Winthrop church from 1943 to 1949. 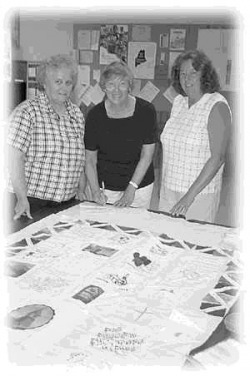 Several women of the church are putting together a commemorative quilt in which all individual members were asked to contribute a panel. Marlene Douglas is leading some of the congregation's children in a skit to reflect on the church's history. And Patrice Putman will help some children bury a time capsule. The program for Sept. 9 includes a 10 a.m. church service, 11:30 a.m. potluck lunch and a 1 p.m. program. For more information, call Marie Pettengill at 377-3052.